Every so often, our local grocery store gives away something for free; sometimes it’s a protein bar; other times, a can of soup. 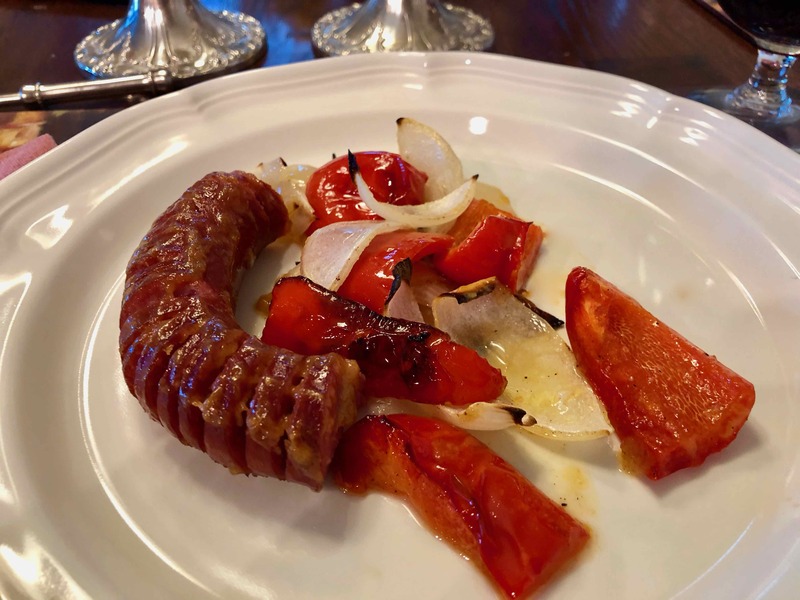 The most recent giveaway was a kielbasa, which coincided serendipitously with the publication of a recipe for Hasselback Kielbasa on the New York Times “Cooking” website. The site’s stunning photo of the dish, along with the above confluence of events, pulled me from my typical traditional stance in the kitchen to give this recipe a try. With so few ingredients involved, most of them, including the kielbasa, already on hand, there wasn’t too much at risk. 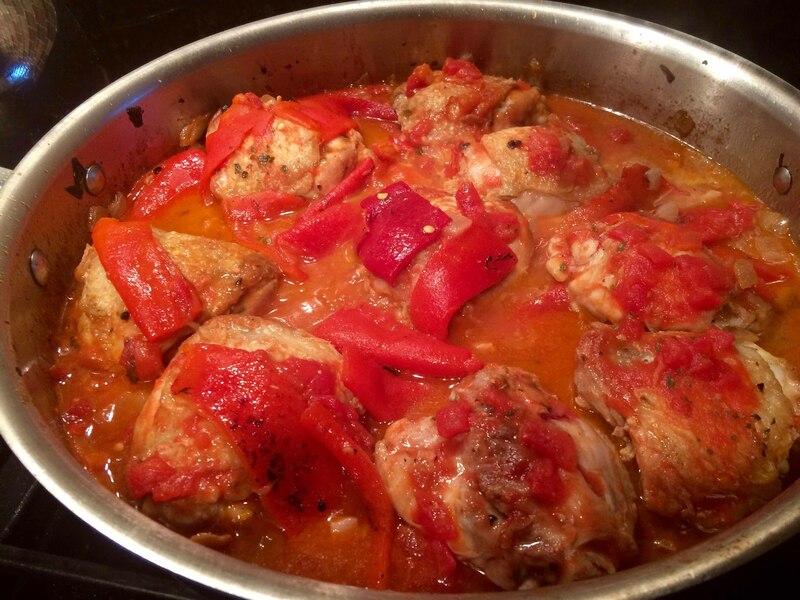 Yesterday, I was inspired by a post on Diane Darrow’s insightful blog Another Year in Recipes to cook one of my favorite Roman dishes, pollo alla Romana. 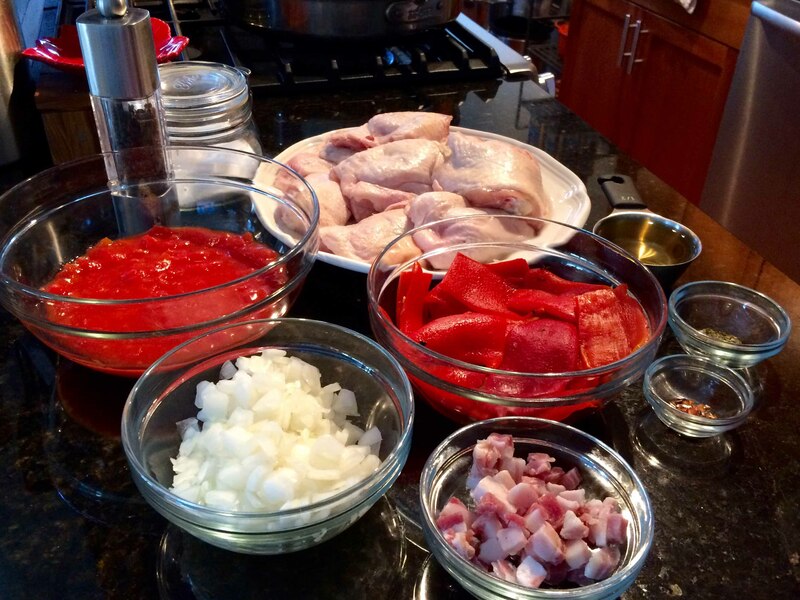 Darrow’s post focused on a contemporary recipe for the dish that she compared with her own, which she had published years ago in The Seasons of the Italian Kitchen. The newer recipe seemed far more involved than Darrow’s, which in my opinion more closely resembled the ones I’ve enjoyed in Roman trattorie. I wrote to Darrow about the recipe I’ve always used for this dish from David Downie’s Cooking the Roman Way, which uses pancetta and roasted peppers. She responded, and I agree, that this recipe may reflect a trend in Italian cooking where people have more interest in experimenting and elaborating on simple traditional dishes. Below is my adaptation of Downie’s recipe, which I must say yields an extraordinary chicken dish with many layers of flavor. I served the chicken with some grilled polenta, but crusty Italian bread would work just as well. 4 to 5 large red peppers, roasted, skinned, and seeded and then sliced into strips 1/2 to 1 inch wide and 1-1/2 to 2 inches long. 1. 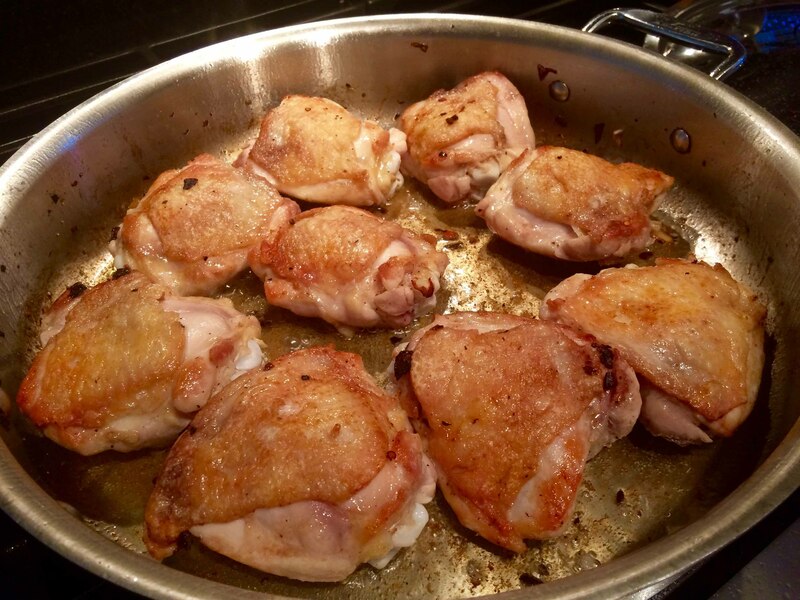 Trim the chicken thighs of any excess fat or skin and pat dry. Season the chicken with salt and pepper to taste. 2. Heat the oil in a large, high-sided frying pan over medium heat. Add the onion and pancetta. 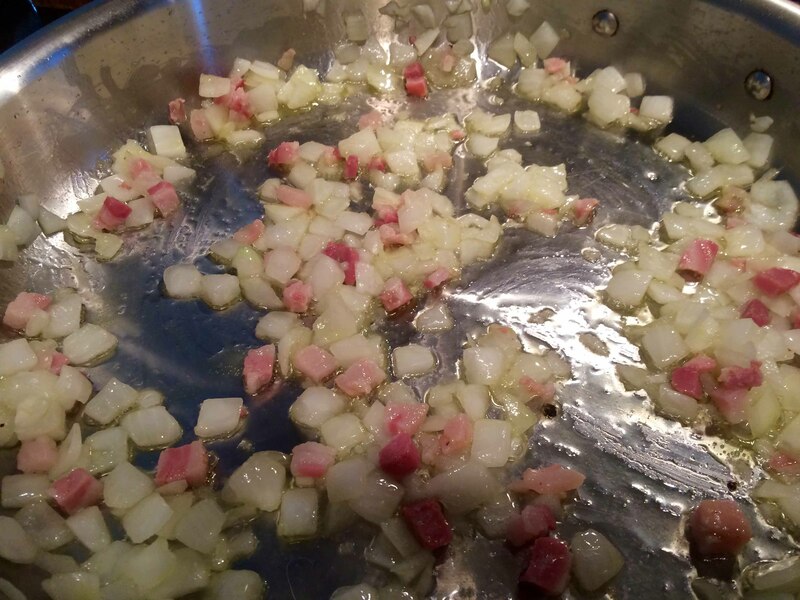 Sauté, stirring with a wooden spoon or spatula, until the onion becomes translucent and the pancetta barely starts to crisp, about 3 to 4 minutes. 3. 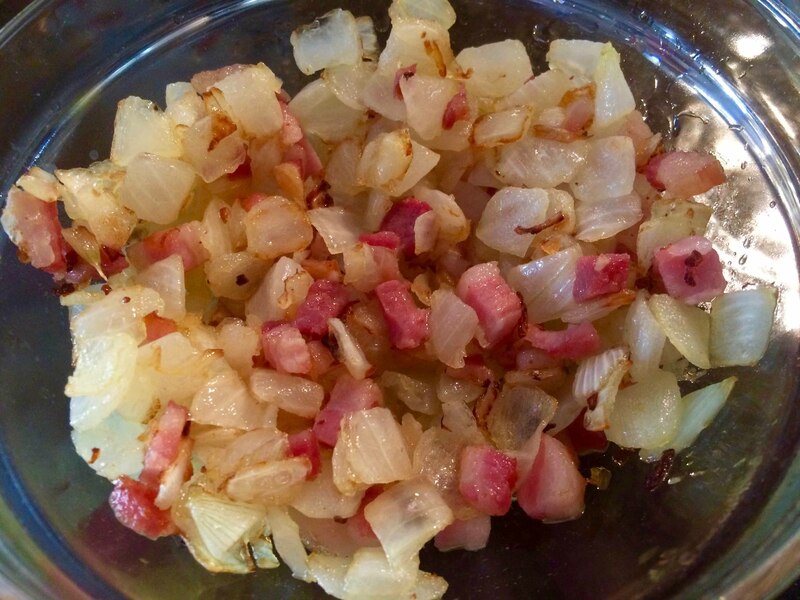 With a slotted spoon, remove the onions and pancetta from the pan to a bowl and cover with a lid. 4. Add the pepper flakes to the pan and stir briefly. Increase the heat to high, add the chicken parts skin side down and brown them thoroughly, turning once, about 8 to 10 minutes. If the chicken is very fatty pour off some of the fat. 5. Return the sautéed onions and pancetta to the pan and stir thoroughly. 6. Pour in the wine and boil to evaporate it, 1 to 2 minutes, scraping any browned bits from the bottom of the pan with a wooden spoon or spatula. 7. Add the crushed tomatoes, the roasted peppers, and the oregano. Bring to a simmer over medium heat stirring. 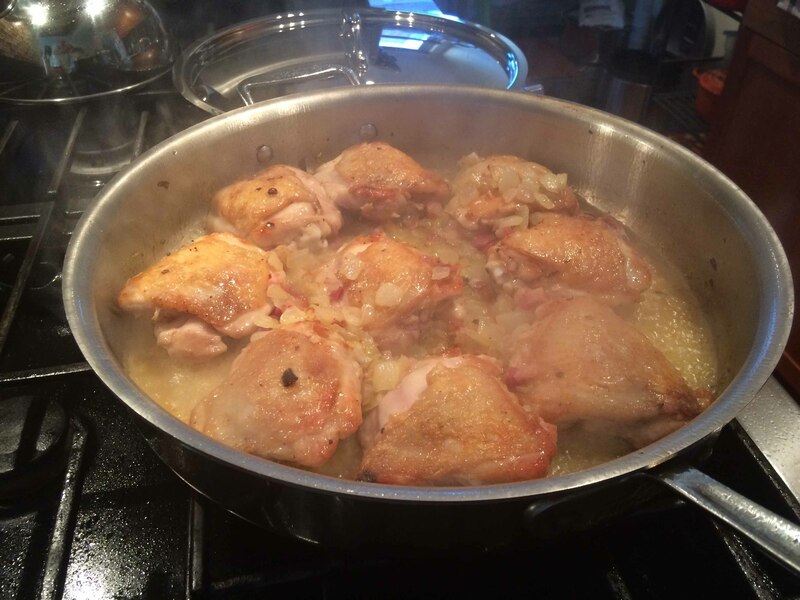 Then reduce the heat to low and simmer slowly, partially covered, for 20 to 25 minutes or until the chicken is tender. 8. 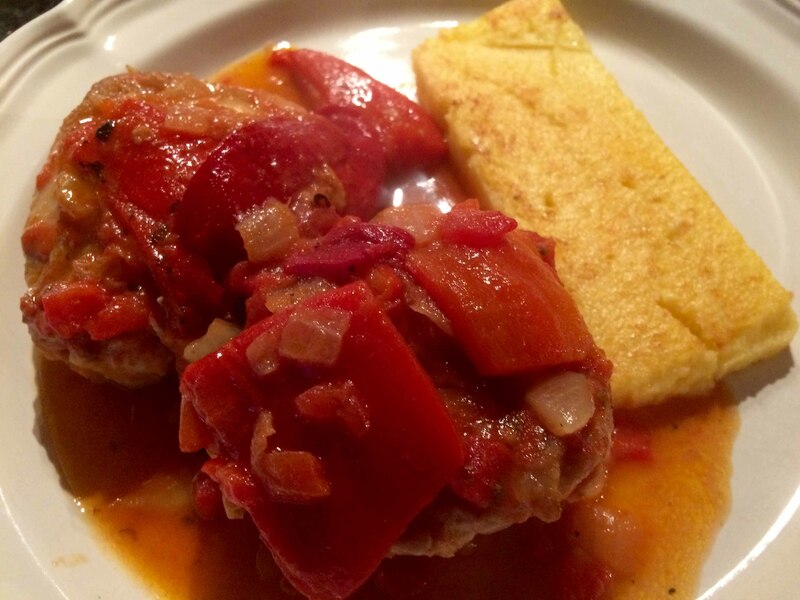 Serve immediately on warmed plates accompanied by polenta or crusty Italian bread.